Stefania Ciocia: I’ve had a feminist summer, and a very good one it has been too. These are the four non-fiction books I have finally managed to dig into, and they are all brilliant. 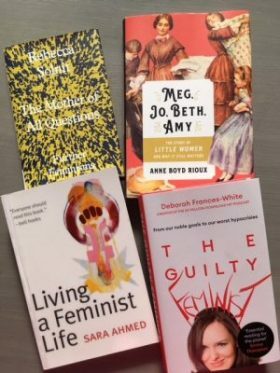 Anne Boyd Rioux’s Meg, Jo, Beth and Amy will inform my teaching of Little Women and the Celebrate the Sisterhood event I’m hosting at the Folkestone Book Festival on 25 November. We are marking the sesquicentennial (great word, isn’t it?) of the publication of Alcott’s novel. I have also read some amazing fiction for my research on short-story cycles: Justin Torres’ We the Animals was a great find. Now I am raring to go back to Jhumpa Lahiri’s Unaccustomed Earth. I first read it a couple of years ago but it has stayed with me ever since. It’s a masterpiece. In my August staycation, I had fun experimenting with my informal academic voice, and gallivanting around London for cultural treats; I saw four plays at the Globe in ten days, and wrote about two of them: here’s my take on Othello, and here’s its sister blog-post on The Winter’s Tale. P.S. Don’t believe the reports that blogging is so 2017, and podcasting is where it’s at now. Blogs still rock. If you are a current or past CCCU Eng Lit student and would like to try your hand at blogging for us, pitch your idea(s) to me and we’ll take it from there. Marianne Brooker: My summer was bookended by conferences in pastures new. I went to Princeton (my first trip to America) to talk about the nineteenth century novelist Barbara Hofland’s geography books and her collaborations with the architect Sir John Soane (I blogged about some related materials and artworks here) – I also stole some time making new friends in Pittsburgh and New York. Later I went to Stockholm for the first time, where I spoke about the poet Samuel Taylor Coleridge’s thwarted encyclopaedic visions, and fell in love with the city’s wild islands and sea air. Now autumn term is upon us and Janet Frame’s Towards Another Summer, Anna Tsing’s The Mushroom at the End of the World and Carolyn Steedman’s Dust are still sitting on my desk looking hopeful. Andrew Palmer: I read Philip Roth’s masterpiece of a novel, The Plot Against America. It was published back in 2004 and tells the story of a populist, racist President coming to power unexpectedly. It’s as if Roth could see the future! The only difference is that the novel is set during the Second World War and imagines that Franklin D. Roosevelt loses the 1940 election to the aviator Charles Lindbergh (a real historical figure with unpleasant views). I love the way Roth creates a child’s perspective and leads the story in unexpected directions. And what amazing sentences! He’s a magician with the English language. I also read a book about George Orwell, to review it for The Times Higher – what I mainly learnt was that Orwell held at least two contradictory views on any topic, and was perfectly capable of expressing all of them with equal force on different days. And every time he did it, he was completely convincing! Another kind of magician. I was also reminded what an excellent essayist he was – try reading his short piece ‘Shooting an Elephant’ for example, which is all about the time he had to do just that in Burma. Peter Merchant – For me the 2018 conference season began in Durham, with a paper which might have found a hearer or two if England and Sweden hadn’t been playing in the World Cup, and ended with me briefly detained at Mr Chivery’s pleasure in the Czech Republic. Nearly two hundred years ago, Silvio Pellico was famously imprisoned in Brno and didn’t like the experience one bit. Its only redeeming feature was the book, still widely read and studied today, into which he was able to pour all of his distress. If his shade had been hovering over Brno Airport on the night when I and the other delegates attempted to return from the conference, but were forced by thunderstorms and a cancelled flight to stay put for 48 hours, he would probably have said that when history repeats itself it is first as tragedy and then as farce. 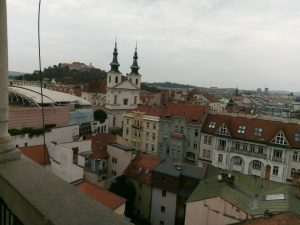 Our farce eventually had a happy ending, both because Brno is a fascinating place in which to find yourself stranded and because those of the conference papers that dealt with Dickens are apparently to be published. One of them, prophetically, had been on prisons in Little Dorrit. Rebecca Pope: I started my summer by making the pilgrimage to The International Congress of Medieval Studies in Kalamazoo, Michigan, the unlikely location for a yearly conference of 3,000 scholars (appropriately nicknamed the Zoo). I presented my research on the missing booklets of medieval romance to a room of my colleagues before heading to one of the many fantastic lectures, performances and dinners on offer. After a brief sojourn to the art museums and blues bars of Chicago, conference season continued in Leeds with another large gathering of medievalists. This time I spoke as part of the Society for Medieval Feminist Scholarship with a group of women all working on gender and romance in the Middle Ages, from Old Norse to Arabic lyrics and Arthurian ghost stories. The rest of my summer was spent finishing my PhD thesis, though I did manage to get in some fun summer reading too. My top recommendation is The Book of Joan by Lidia Yuknavitch (2018) an immersive re-imagination of three famous medieval figures: Christine de Pizan, Joan of Arc and Jean de Meun in the dystopian future of 2049 – sci-fi and medieval literature? Yes please! Emma Scanlan: This summer I have read (aloud) Peepo, Dear Zoo and Guess How Much I Love You multiple times. In my defence it has been a summer of other firsts, new priorities, and different challenges. It was my first summer as a mother and my first as an editor. Once the calm of naptime had descended each day, I opened my laptop and read the most recent version of whichever article I was editing for the Journal of Postcolonial Writing. Our Special Issue will be titled “Pacific Waves: Reverberations from Oceania” so the almost tropical sunshine we basked in throughout July went some way to making me feel at one with my subject matter. Editing work followed me on holiday this year, to a canal boat in Northamptonshire, but unfortunately the weather from the “tropical south”, as my Scottish relative calls Kent, did not — however, even persistent drizzle couldn’t dampen the stunning views across the countryside of middle-England, and we spent our spare time tramping canal paths with the baby in the backpack, kept happily quiet chewing her way through The Very Hungry Caterpillar, finger puppet edition.